Story: On November 13, 1974, Suffolk County Police received a frantic phone call that led them to 112 Ocean Avenue in Amityville, Long Island. Inside the large Dutch Colonial house, they discovered a horrific crime scene that shattered the landscape of the typically peaceful community: an entire family had been slaughtered in their beds. In the days that followed, Ronald DeFeo, Jr., confessed to methodically shooting his parents and four siblings with a rifle while they slept, claiming 'voices' in the house drove him to commit the grisly murders. One year later, George and Kathy Lutz and their children moved into the house thinking they'd found their dream home. But shortly after settling in, bizarre and unexplainable events began to occur - nightmarish visions and haunting voices from an evil presence still lurking within the house. Confused and frightened by her daughter Chelsea's cryptic interaction with an imaginary friend named Jodie, Kathy struggles to hold her family together as George's increasingly strange behavior finds him spending days and nights in the basement of the house, where he soon discovers a passageway to a mysterious and gruesome 'Red Room.' 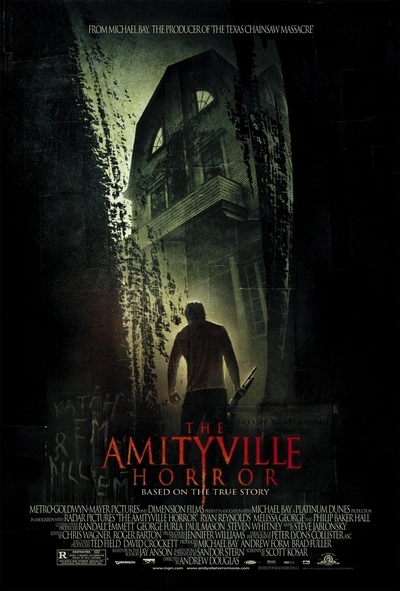 With lucid visions and evil voices swirling through George's head, the house comes alive in a terrifying climax that finds him carrying out the spine-chilling events that would become forever known as The Amityville Horror.